I know I was to post the winner on Monday. But I got delayed!!! First, I thought I would read all of the comments. That was a lot of fun. All of your are lovely! 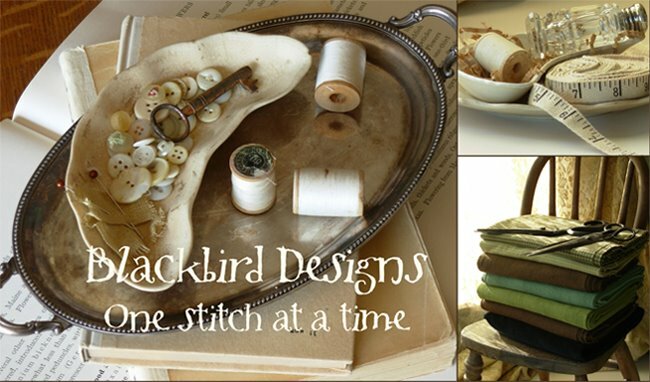 Barb and I are very lucky to belong to this stitching community. We couldn't find nicer people anywhere! I didn't think to use the huswif for my jewelry. I'm always trying to figure out where to put my earrings when I travel. Thank you for the idea! I tried to master the disaster in my studio over the weekend. That task spilled over into Monday. Sorting and organizing can take me quite a bit of time. No party here...believe me! To top it off I get distracted. Stacks of magazines can be bad. Major time can be spent on deciding what to do with them. Should I give them to Goodwill or keep them? Do you have that problem too? Hopefully I'm not the only one. The pictures are so nice....and what if I get rid of just the one that has the idea I might need? Finally, I had to quit looking at them and just boxed them up for Goodwill. I just couldn't deal with it anymore. Next I ran into some of my journals while dusting. I used to keep one every year. I wrote about projects, family, nature and recipes. So I had to sit down again and read about what I did years ago. 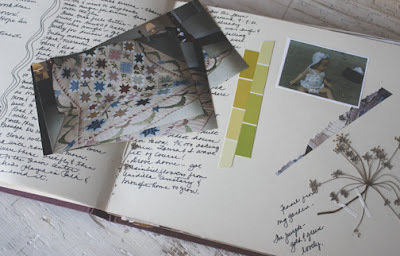 I found some pressed flowers, a picture of the Kansas City Quilt Guild's raffle quilt I helped design years ago. It was fun to see it again after all of these years. I wonder who purchased it? 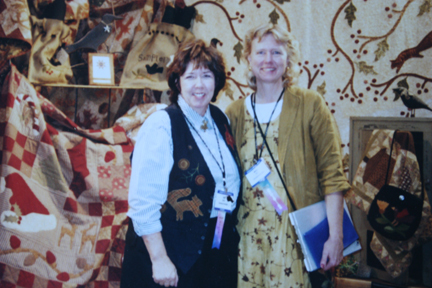 Found a picture of Barb and I at our first quilt market in Houston, TX. We looked so young! The picture was taken in 1999. Do we look nervous? We sure were at first!!! We didn't know how our book would do. We did win a prize for the booth..."Best New Exhibitor." That helped ease our fears! 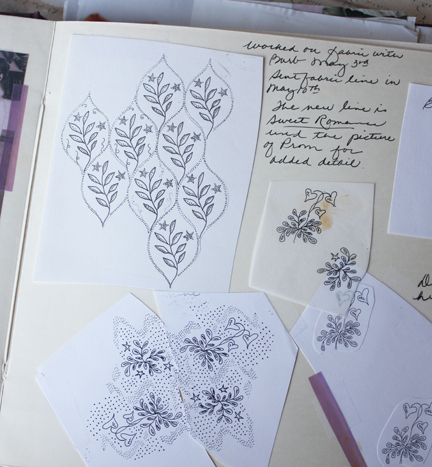 I saved some copies of drawings we worked on for our fabric line Sweet Romance for Moda fabrics. 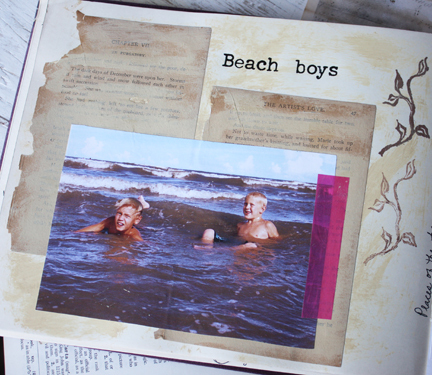 I'd made a color copy of one of my favorite pictures of my two oldest boys at the beach....you can begin to see that cleaning a studio can be tricky business.Once you go down memory lane it's hard to find your way back! 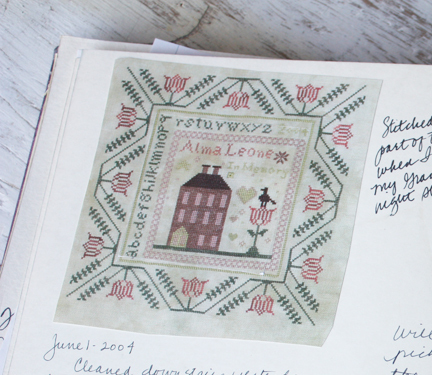 Saved in the journal was a color copy of the sampler I stitched in memory of my grandmother. I make color copies of each sampler when completed. I then use the images in my journals to record when they were completed ....but I digress. I've got to get back on task.....We need to find out the winner of the contest! Blueberry crumb cake is beautiful. So happy to hear I'm not the only A.D.D. sufferer...hits me hard when I'm "cleaning/organizing"! Guess that's why I always enjoyed reading "If You Give A Mouse A Cookie" to my daughter when she was litte...I could SO relate!!!! I have been thinking about cleaning, lots and lots of thinking, lol. Congratulations to Quilt cookie! Congrats to the winner ... I'm green with envy! Congratulations to the winner!!! I know what you what you mean about cleaning....I too get distracted and look over everything....but it is so much fun going down memory lane!!!!!! Those memories are so sweet... the memory sampler for your grandmother is so special and pretty! Congrats to the winner I know she will enjoy those lovely fabrics. Alma it looks like you had a great weekend down memory lane. That time was well spent. Love to see a peek of it. Fun looking at some of your memories. By the way, you need to update your blog sidebar to read 12 years instead of 10! Congrats to the two of you, too. Any word on when we might see Loose Feathers, Part 2? I have had Part 1 finished for what seems like forever, and my Woodland Berries is framed! I should send you a photo. I love the pic of you and Barb at your first market. The journals are so much fun too! You always make everything so that it's amazing. Congrats to the winner! Alma, I remember those young gals...neither of you have changed a bit!! I so wish I could be brave and box up my treasures for the Goodwill. Maybe some day I will have your courage. I have say that 'Sweet Romance' has been, no is my all time favourite fabric ... just love it and have a huge stash!! Congratulations to the winner! I loved hearing about the cleaning out of your studio! I tend to get sidetracked too. I recently donated a lot of magazines. It is hard to let them go, but too overwhelming to keep them all! I always think, someone else will get to enjoy these too! 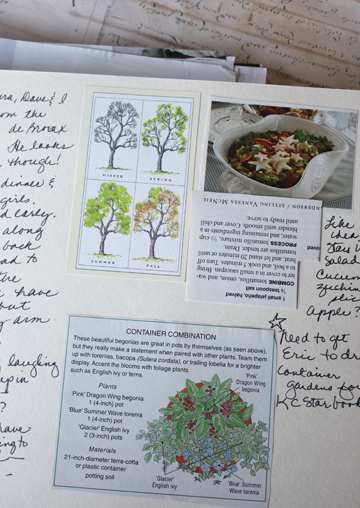 I also enjoyed seeing your lovely journal pages! I love the sampler you stitched for your grandmother. The photo of you and Barb is so lovely! I have the same problem with magazines! They can take over if you're not careful. Lovely sampler in memory of your grandma, too. I think I would have been stuck at the magazines and journals too! Was your first book Nuts and Berries? I'm hoping I have all of your publications and will not send them to Goodwill! What was your first fabric line? Love, love, love all things Blackbird. I'm still working on Anniversaries, but have taken a side road to Halloween projects. Nuts and Berries was our first book and Higdon Camp was our first fabric line with Moda Fabrics! OMG look at that picture of you girls...your first Market and mine...we were so excited and so much younger...How fun! Congratulations to quilt cookie - and thanks to you gals for such another great giveaway! i am pretty sure we had the same first market year... fall right? Awesome And Amazing information that I heard first time,Its very shocking and amazing for me.